Don't you just love a surprise on a tiara night? It's so often the same old, same old: everybody either has their favorites that they repeat over and over again (ahem, QEII), or they only have one or two to pick from, so surprises are just out of reach. 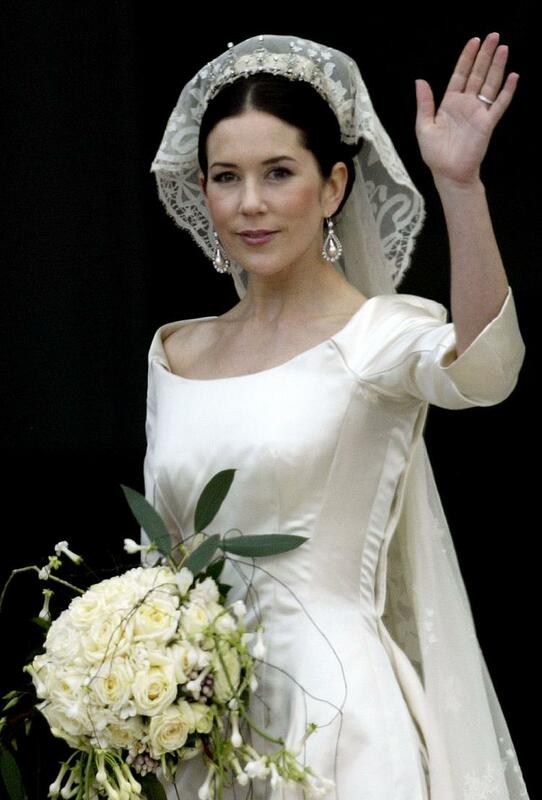 Falling in the last category is Denmark's own Crown Princess Mary. 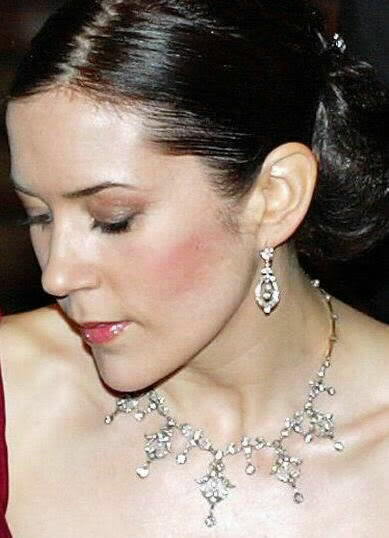 She has two tiaras: the Ruby Parure tiara (which she last wore at Crown Princess Victoria's wedding), and her wedding tiara. 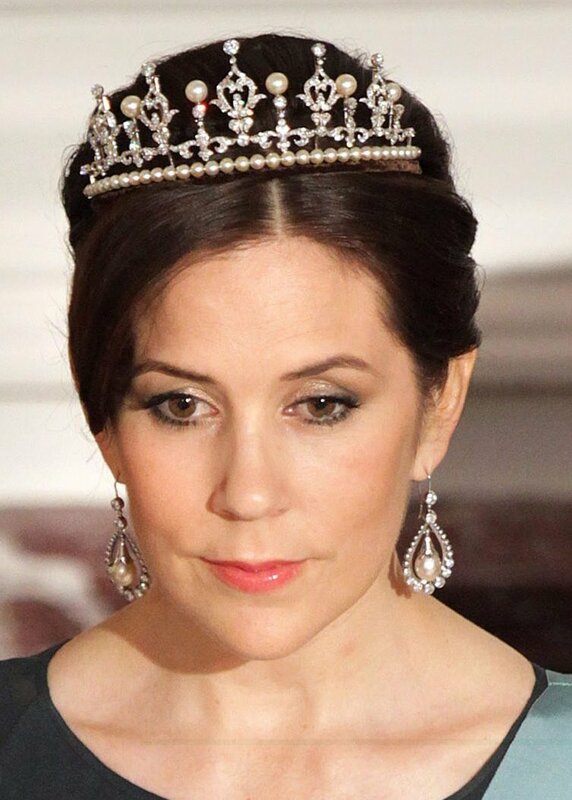 Every now and then, she'll bust out a third, the Midnight Tiara (which we saw during Queen Margrethe's birthday celebrations), but that one is a loaner. 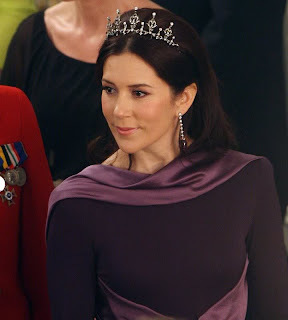 Needless to say, she caused quite a stir when she turned up during South Korea's state visit to Denmark in a tiara surprise - her wedding tiara, fancied up! This tiara made it's royal debut at the wedding of Crown Prince Frederik and Miss Mary Donaldson. It was a gift to Mary from Queen Margrethe and Prince Henrik, and is thought to have been purchased at auction for her. In its original format, it's a rather tiny, all diamond affair. And as I've said before, in my opinion, it was no match for her major wedding veil and hair. She alternates between the wedding tiara and the larger ruby tiara, with the very occasional glimpse of the Midnight Tiara. Seems to me she uses the ruby tiara for the more important occasions (such as New Year Courts) and the wedding tiara sort of fills in for other events. It can also be worn as a necklace, and I've never been able to figure out why she hasn't worn it more often as such. It's gorgeous that way! As we can see, she has added heft with pearls: a row at the bottom, and on the tops of the lesser spikes. This new version will be an excellent complement to the pearl jewelry she owns. At the state visit, she made a divine match with her wedding earrings, and she has some giant South Sea pearls and a fantastic aquamarine pearl choker as well (South Sea pearls can be seen in the above collage, bottom row 4th from left; aquamarine choker can be seen in the collage on the top row, 3rd from left, and bottom row, second from left). The pearls were added by Marianne Dulong, and they are removable so that she can wear the tiara either way. (Flexibility in tiara options always gets bonus points!) Looks like it would be easy enough to revert back to me. The only downside I see here is that the new prominence of the base really highlights the positioning of the tiara in her hair. 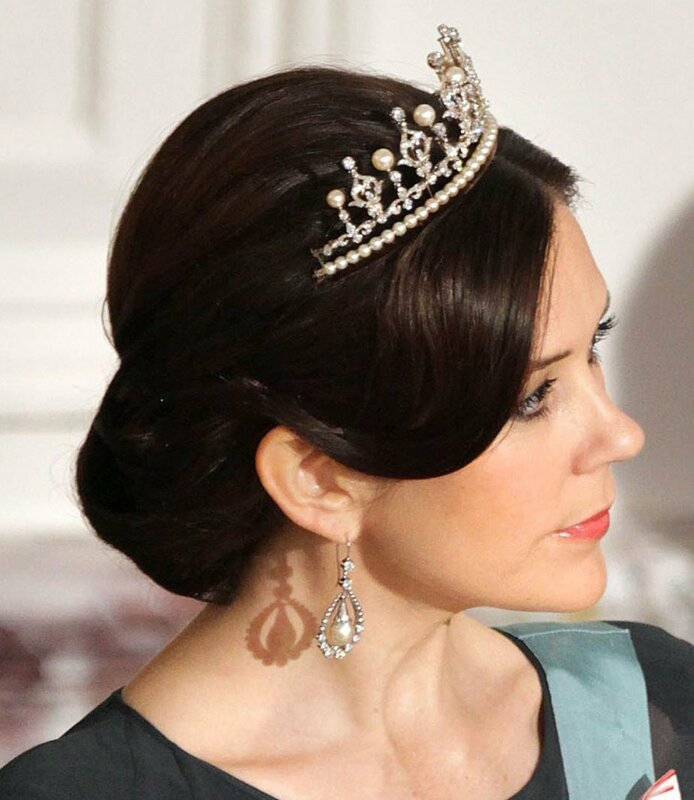 I mean, when the lovely Royalty Online tweeted me a link to pics from this event, she did so with this warning: Don't freak out about the crooked tiara! It also seems to have a tighter circumference on this outing, perhaps owing to the change requiring a new frame or at least an altered one. That gives it a more crown-like appearance, and also makes it harder to sit on the head. But other than that, I'm on board. Mostly because, you know, I can't argue with adding more. (We all have our weaknesses.) Are you a fan of the changes?